Friday April 12th 1901 I was busy about home all the forenoon and in the afternoon was over to Mrs Kozer. It was a cold day for the time of year. Saturday April 13th 1901 I did baking and got the dinner and in the afternoon went to town with Will. I did some trading and walked over home to wait for Will They were cleaning up the yard. Sunday April 14th 1901 Will and I went to the valley. it was a nice day. We went down to Henrys old place first and then back to Aunt Ellens for dinner. Mother & Ott were there and we had such a good visit. 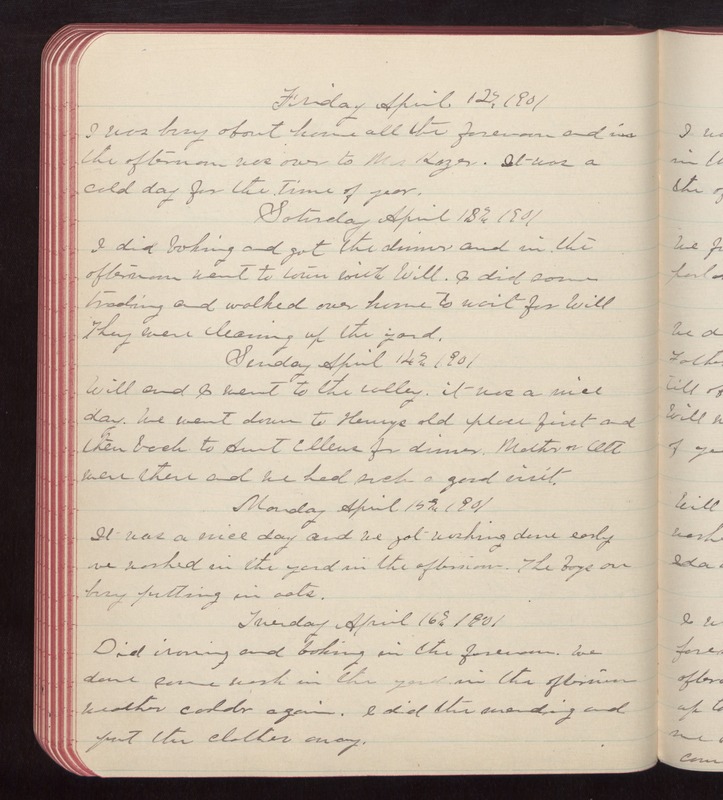 Monday April 15th 1901 It was a nice day and we got washing done early we worked in the yard in the afternoon. The boys are busy putting in oats. Tuesday April 16th 1901 Did ironing and baking in the forenoon. We done some work in the yard in the afternoon Weather colder again. I did the mending and put the clothes away.